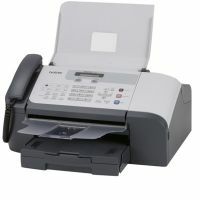 This economical, monochrome inkjet fax machine is the ideal solution for budget minded consumers with low-volume faxing. Perfect for a home office or small business, the affordable IntelliFax-1360 is well-equipped to handle basic fax applications. Handles black and white fax and copy needs. In addition to basic faxing, the IntelliFax-1360 also performs convenience copying, with crisp clear output generated at up to 18cpm. 14.4K bps fax modem. Fax throughput with transmission speeds as fast as 6 seconds per page, and a QuickScan feature that lets you retrieve your original and get back to work while your document is being transmitted. 16MB memory. 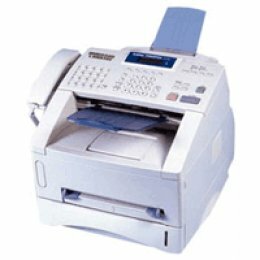 Stores up to 300 fax pages if the machine runs out of paper or ink while unattended. It can also be used to store multiple fax documents that can be transmitted sequentially, as soon as the line is free. Flexible paper handling. A generous 100-sheet paper capacity reduces the time you'll spend reloading paper. An automatic document feeder permits unattended feeding of up to 20 pages for faxing or copying. Compact, space saving design. A combination of fold-out paper trays, front-loading 100-sheet paper input capacity, and front-panel access for replacing the ink cartridge makes this one of the most space-saving models of its kind. Caller ID and Distinctive Ring Detection ready. Customers subscribing to these services through local phone companies can utilize them on this versatile fax machine as well.